Hi friends! Here is a simple,delicious and very healthy recipe of an Indian side dish of yogurt containing yellow pumpkin and spices. Peel, wash and then cut the pumpkin in to small, slightly thick pieces. Put the pumpkin along with two cups of water in a pan on a high flame. The moment water starts boiling, reduce the heat to low flame. Pumpkin will boil in eight to ten minutes. Strain out the water from the boiled pumpkin and let it cool. Mash 1/4 of the boiled pumpkin a little with the back of the ladle. Whisk the Curd/ yogurt till smooth. Add salt, sugar, pepper, red chili, cumin powder, black salt, and mix well. Fold in the boiled pumpkin pulp as well as pieces. Mix well. Heat oil in a pan add mustard, when it starts crackling, add asafetida fry for few seconds. When asafeida turns pink add curry leaves, fry for few seconds, switch off the stove. Pore the seasoning on the Raita, mix well. Refrigerate and serve cold, with rice dishes and your favorite Indian bread. 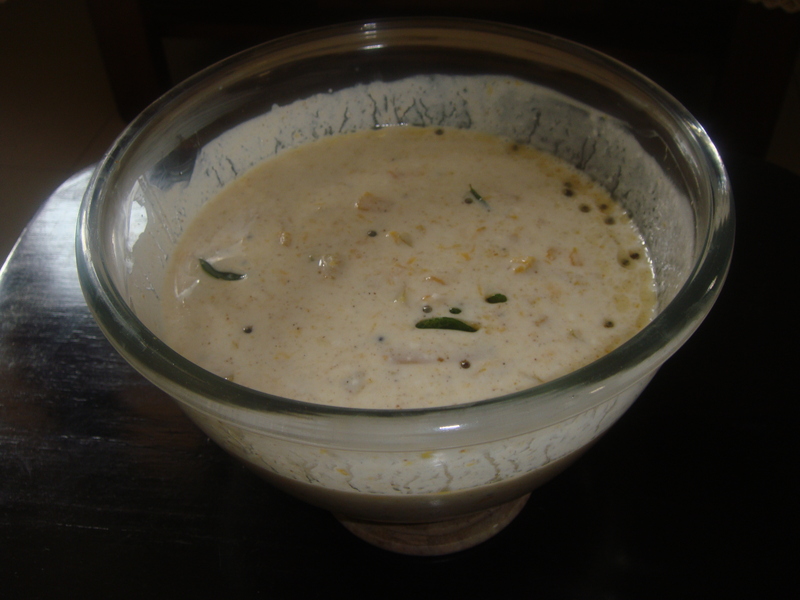 Note: Pumpkin raita like all raitas help in digesting the food. WOW , v simple to prepare and extremely delicious. Hello Aunty! It’s me again!! I just wanted to let you know that i was CRAVING for your pumpkin raita, so i went and specially bought kaddu and curd.. it turned out amazing!!! the first taste and i was transported back to archana’s house where i tasted it for the first time! Not that i got it exactly as you do!! I would love to post a pic but i dont know how! Since i was on your blog, i simply HAD to look up this recipe again!! My mouth is watering just looking at it!! Have to try it out again! !